I think this Leanna butterfly die is absolutely the perfect butterfly! I have always been a fan of anything filigree, so it is a must-have for me! It's small enough to be added to other elements, but so beautifully detailed that it can stand alone. Here I used a variety of pastel Basic Grey solid papers from several of their 6" pads and sprinkled my butterflies all across the surface, along with some tiny pearls in the same colors. 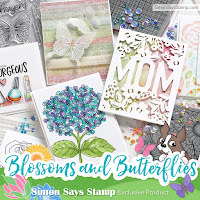 I thought that the sentiment from Simon's You set was just the right complement to them, large enough to be noticed, but small enough to not detract from the beautiful butterflies. When I make my cards and photograph them, I then go to my computer and edit the photos with my card in view. As I was editing this card, I glanced over and noticed how the bright track lights above my computer desk made these shadows and decided to share that with you also. Cath has given us another fun challenge at Moxie Fab World, and she calls it Trendy Triangles. I loved all the examples she showed us and I dived in later the same day and started experimenting. But I came up with nothing that pleased me. Until I was browsing on Pinterest and found this quilt, which hit all my buttons, and it was made of TRIANGLES! This pin doesn't take me to any blog, but it is identified as being made by Ashli Smick, using Half Moon fabric. I just loved her colors and the uses of the chevrons and big dotty fabrics. So I spent an afternoon trying to find some papers from my stash that would recreate this wonderful quilt. How'd I do? These papers came from as many different pads as there are patterns here. As I always do, after piecing it together, I ran it through an embossing folder by Darice called Simple Interlock. And I popped the pieced panel above my card base. I know there isn't a sentiment on it, but a simple white banner can be added when/if I need one. I love these kinds of designs, where your brain forms different shapes depending on what your eyes focus on......I can see an Ohio Star block, squares within squares, and pinwheels, just to name a few. Some business first. I used Random.org to choose from among the comments left on my Picnic blog post, and the winner is Stacy K. Brais. Congratulations, Stacy! Flourishes is celebrating their 6th anniversary and this fun challenge called Six for Six gives us a recipe with 6 items we need to include on our cards! A novel idea! Lilies of the valley are a sentimental favorite of mine, so I was thrilled when Flourishes made this stamp set. Thanks for a fun challenge, Flourishes, and Happy Anniversary! Here's to at least 6 more!! After finishing the inking, I trimmed my panel, ran it through a houndstooth embossing folder, and then framed it in grey before adding it to my card. I thought this sweet sentiment from Ali Edwards was a perfect match. Penny Black is running a 2-week promotion, encouraging us to share what we've been working on this summer, stamp-wise! It can be any theme you'd like to share, and any type of project, as long as you use at least 1 Penny Black stamp. And of course there are prizes involved! Click on the logo above to get all the details. Did you know that you can join the free Penny Black Club for first looks at new products? HERE's the link to sign up! As a member of the Club, you'll be the first to get any news about new releases or special promotions! If you're here for the Hero Arts Hostess Summer Picnic Blog Hop, please click HERE. Thank you! 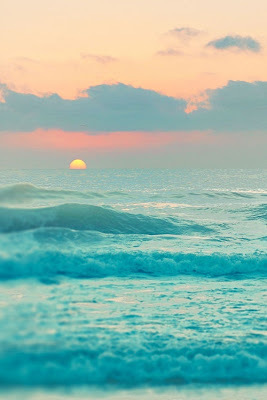 Isn't this a gorgeous image? I skidded to a stop when I saw it at Sue's blog, and then headed over to the Papercraft Star Challenge to check it out some more. The colors here are magical! I just bought some new paper pads, and sure enough, I think these papers match the colors pretty well - what do you think? I loved working on this - hope you like it too! If you're here for the Hero Arts Hostess Summer Picnic Blog Hop, please scroll down one post or click HERE. Thank you! 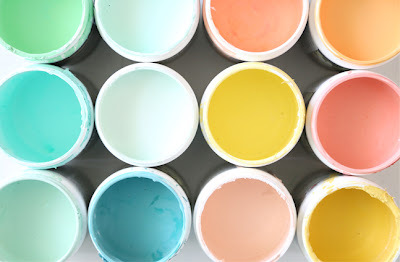 Jackie's challenges using the revolving colors of her blog header are fun! This is the 3rd color she's used, called nectarine. The random winner of these challenges will win a blog header that she's designed! I am so excited, as are my Hosti sisters, to be a part of another of our Hero Hostess Blog Hops! 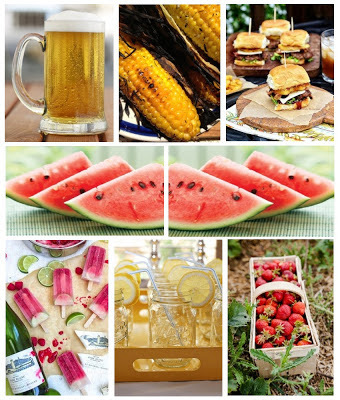 We had so much fun last January that we decided to do it all over again this summer, using as our theme Summer Picnic! The Hop began on Monday, and we've set a nice easy pace of 4 or 5 blogs each day, so you can take your time all this week. Hero Arts will be awarding prizes from randomly drawn comments. For a chance to win, simply comment on ANY of the stops along the Hop on ANY day, including each day's starting post at the Hero Club Blog. The more comments you leave, the better your chance of winning! And I've added a little giveaway of my own, see more below. You should have arrived today from Arlene's blog. If you just happened across me and would like to start at the beginning, go to the Hero Arts Club blog, where you'll find the line-up for today. Our fearless leader, Deborah, has been writing some hysterical posts there each day that you won't want to miss! If you find a broken link, please report it to: blog@heroarts.com. Let's get started! I knew immediately what I'd make.......a jar of pink lemonade against a quilt background. I love lemonade on a hot summer day, and pink lemonade is even better. Add a well-loved quilt spread out on the grass in the shade, and I'm in heaven! We also decided to share a favorite summer recipe. Mine is a Pasta Salad that I found in our kids' grade-school cookbook, way back in the 1980's. In my opinion, it's best made when the little Sweet 100 cherry tomatoes are being harvested - they taste like candy! You can add anything you like to this recipe, but it's the dressing that makes it, I think! Toss all together and keep refrigerated until time to eat. I'm the final stop of our hop for today, but be sure to check the Hero Arts blog tomorrow for the new lineup for Friday. Thanks so much for visiting - hope you're enjoying our virtual picnic! 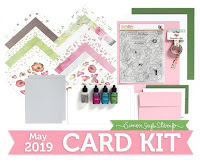 I'd like to give away a Hero Arts/Archiver's Arrows exclusive stamp and die set and a set of Hero Arts ink cubes, including the new peach and mint julep colors. Just be sure to leave me a comment here by 11:59 PM EDT, Saturday, July 27, and I'll use random.org to choose a winner. I'll announce that name on Monday, July 29 here on my blog. Happy Wednesday everyone! 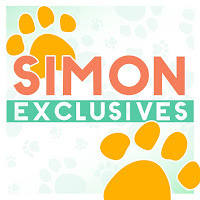 We have a really fun challenge for you this week at the Simon Wednesday Challenge blog! We're calling it Summer Food and/or Drink, and the Design Team is playing with Hero Arts products this week. Wait 'til you see my teamies samples! 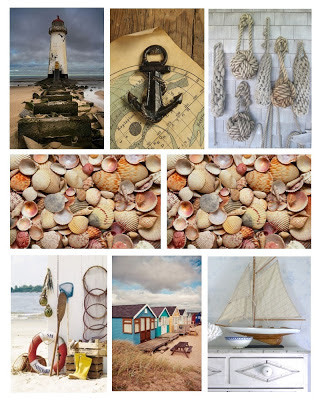 Here's an inspiration board for this week's challenge. When I was thinking what to do, I remembered this Love Jar set, which includes the jar and the citrus wedge, and I decided to fill my jar with limeade, a favorite summer beverage for me, and take you all on a picnic, complete with a red and white quilt spread out on the grass! I stamped the jar on vellum and then on the reverse of a lime cardstock, and used a slightly darker lime cardstock for my lime wedge, stamped in Hero Arts Green Hills mid-tone ink. The straw was in a Simon CardKit from March this year. I chose some red and white patterned design papers from various pads and cut them using a die that I think came with my Cuttlebug machine years and years ago. To make everything fit, I punched the edge of my card with a Daisy border punch (thank you Jackie! ), and lined the inside of my card with a strip of red to make it show up better. Heidi has offered up another $50.00 gift voucher for the random winner of this challenge - I can't wait to see what you make for us this week! 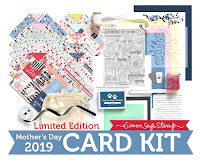 Jackie at Rockwell Designs has given us an interesting challenge: she's systematically changing out the colors in her blog header and she's invited us to play along as she does, and make a card for each color. She's in her 2nd color now, and since I love color challenges, I'm all in. I'm catching up with 2 cards today. My papers are from Studio Calico's Darling Dear pad, and the sentiment is a new The Craft's Meow one, stamped in mid-tone pool ink. I added some twine, too. I've had that paper in my stash forever, so I was glad it worked for this challenge. I added some grey-striped washi, and a PTI daisy die, centered with a big button in the same color. My sentiment is from one of Hero Arts' oldest clear sets, but I still love this sentiment. It was stamped in their mid-tone charcoal. 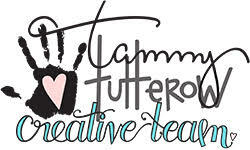 Jackie will choose a winner from all of her challenges and that person will win a free custom blog header design by Jackie! Goodness knows this blog could use a facelift, so I plan to play as often as I can! Hope you will join me! Flourishes is celebrating its 6th anniversary with 2 weeks of challenges and giveaways! Their first challenge is called Black & White. I thought this was the perfect opportunity to use this darling silhouette from their Sweet Days of Summer set. I also used their stamps Picking Wildflowers for the sentiment and Strips & Stripes, along with a Die-Namics Decorative Doily, punched Martha Stewart butterflies, and a Sizzix little flowers embossing folder. Welcome to the final day of our July release preview week at The Craft's Meow! You've seen all 5 of our new sets each day this week, and today we're having our traditional Blog Hop. 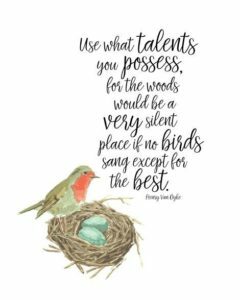 You should have arrived from Jinny's blog, but if you'd like to start at the beginning, please go to The Craft's Meow blog for a list of all the blogs participating. Once you get started, you should be directed from one blog to the next. I know you'll love what my team-mates have done with these new sets! You can now see and purchase all of our July sets at the Craft's Meow store! Would you like to win ALL of them? Just leave a comment on each of our blogs (you'll increase your chances that way) by 8 PM PDT on Tuesday, July 23, and Lisa will choose a random comment from one of our blogs! The winner will be posted at The Craft's Meow Blog on Wednesday, July 24. Good luck! Now, hop on along to Mindy's blog! 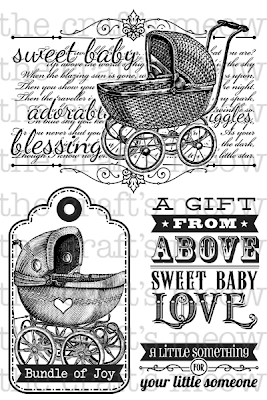 This set includes 2 different hand-drawn circles with 5 different sentiments that can be put inside. I made a really fast card today using these washi tapes and some buttons in my favorite pinks and greens, and also added a little twine bow to the mix. Please visit The Craft's Meow blog to see what my team-mates did with this lovely stamp set. Leave a comment there by 8:00 PM PST tonight for a chance to win it! 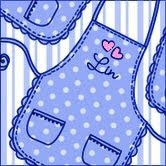 Lisa will be giving away a set to one lucky commenter at The Craft's Meow Blog! And please come back again tomorrow for our traditional blog hop featuring all of our new sets this month (with a chance to win them ALL)! Starting with a piece of graph paper, I embossed the desk lamp using a bright green embossing powder, then stamped the light in yellow. Then I trimmed out the panel and punched a notebook edge along the top. My design papers are from Studio Calico (Darling Dear and Classic Calico) and October Afternoon (9 to 5). Although there's a paper clip image in this set, I chose to use a real one. I know you'll want to visit The Craft's Meow Blog to see my teamie's ideas on how to use this fun set! While you're there, don't forget to leave a comment by tonight at 8:00 PM Pacific time, for a chance to win it! I hope you'll come back tomorrow to see another of the new releases! Isn't this image wonderful? Nina has such a talent for this style! For my card I simply found some papers that I thought were the same feel as Nina's vintage baby carriage, and let her image stand for itself. My papers are from Authentique's Cherish Collection - I simply added some punched lace and some rolled roses, and colored the carriage a pale sage green. Please visit The Craft's Meow blog to see what my team-mates did with this lovely stamp set. Leave a comment there by 8:00 PM PST tonight for a chance to win it! Lisa will be giving away a set to one lucky commenter at The Craft's Meow Blog! And please come back again tomorrow for a preview of another of our new sets! If you're here to see my post for The Craft's Meow July release, please scroll down a post or click HERE. 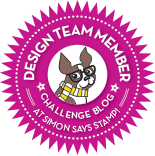 And some housekeeping information: our Simon Says Stamp Challenge blog has changed it's name and moved to WordPress! You can now find us at Simon Says Wednesday Challenge. Please change your bookmarks. 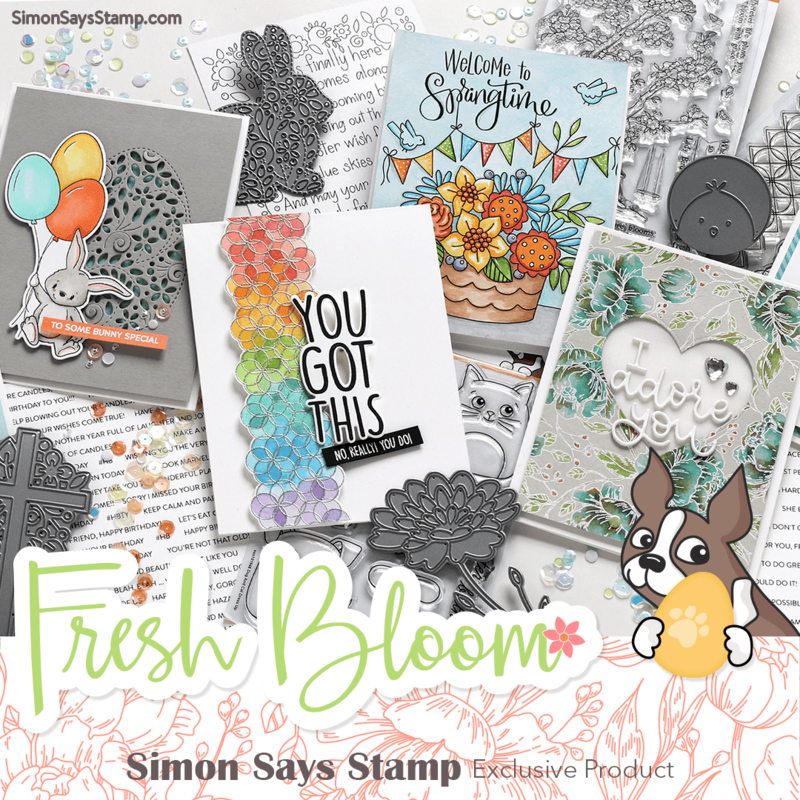 I chose 2 products from Fancy Pants Down by the Shore collection: the 6" paper pad, and the Flair set. Following a sketch, I used lots of the papers, making one of them into a little tag. I even used the cover of the pad for my sentiment! I used the sentiment from a Technique Tuesday Ali Edwards stamp set, Bring on the Sun, and added some die-cut clouds and a sailboat I made using geometric shapes. 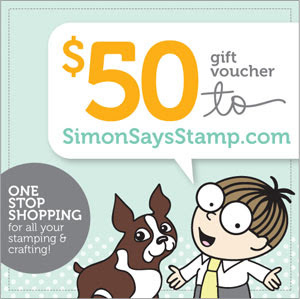 What would you choose at the Simon Says Stamp Superstore? Thanks for visiting me today! Be sure to see what my teamies did for this challenge! I had lots of fun with this one. I used both sizes of the pigs along with just one of the 8 punny sentiments in this set. My papers are mainly from MME's Six by Six Happier paper pad, and I added some washi tapes and a piece of pink ric-rac. Mindy's 2nd set is named Turtle Love. I chose the large turtle and a cute sentiment from this set, and paper-pieced it using papers from MME's Collectable "Notable" paper pad. I glued on some sequins to give her a little pizazz (thanks, Heather). Underneath them are really some cute little hearts. Please visit The Craft's Meow blog to see what my team-mates made for you today, and then leave a comment there by 8:00 PM PDT tonight for a chance to win one of these new sets. And come on back tomorrow for a preview of another July release! Starting with the lightest shade of Hero Arts pool layering papers (shallows), I white embossed this old Hero Arts Lace Background stamp . Then I die-cut a Die-Namics Oval Decorative Doily from an ivory cardstock, stamped my sentiment from Flourishes Picking Wildflowers in soft pool ink, and added the smallest ivory/cream buttons I could find in my stash. The lovely ceramic flower is the perfect color - it was given to me almost a year ago by my friend Marcy, and I've been hoarding it ever since. Thank you, my friend! Back when I was a teen, a beautiful pin would have been worn right at the top of this blouse, between the collars. The rest of my week right up to the due date for entries to this Trigger, is booked, so I had to post this NOW! 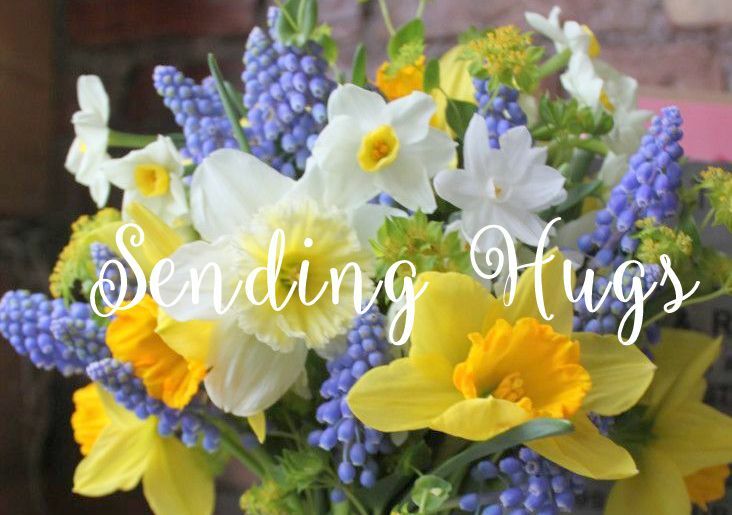 Thank you, Cath, for a beautiful inspiration! Being my literal self again, this one uses white cardstock and a Core'dinations one, along with some vellum, which I embossed in the Victoria folder. The sentiment half-circle is made with an old Fiskars Circle Border punch called Heart of Hearts. My sentiment is from Hero Arts Beautiful Peacocks. 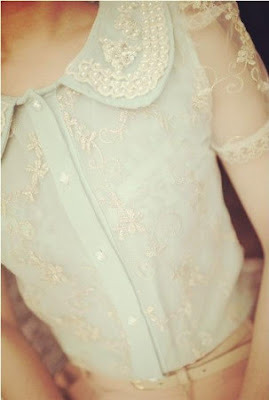 And this time I could use tiny pearl "buttons" on my organza ribbon placket.